You will see a number of financial and credit score consequences if you default on a private student loan. Many borrowers think a default will relieve them of loan responsibility. They plan to accept the credit score penalty in exchange for getting out of the debt. Unfortunately, defaulting does carry penalties, but it does not remove the obligation to pay. You are legally obligated to make payment on a loan when you sign the contract. If you default, you will have to resolve this obligation through a detailed process. The fist thing that happens when you default is your credit score drops significantly. In fact, your score will drop with every payment you miss during the default process. It drops a small amount when you are 30 days late, more when you are 60 days late, and up to 50 points if you are 90 days late or your loan is delinquent. Once a loan is delinquent, and you do not respond to attempts to collect, it becomes a bad debt, and your score may drop several hundred points. You will receive a notice of default on your student loan debt. Most of these loans do not use collateral, so you do not face the threat your collateral may be seized. You do, however, need to respond to the notice with your intentions. Those intentions may be to declare bankruptcy. Otherwise, you will need to determine how you will satisfactorily settle the remaining debt. The lender may be willing to reduce the sum you owe, but you will have to repay at least the principal sum in most cases. If you do not respond to these attempts to collect on the debt, you will face the threat of lawsuit. Small debts, like utility bills or medical bills, often go to a collections agency. The collections agency will continue knocking down your credit and eventually give up if you do not respond within a few years. However, a student debt is a much larger obligation in most cases. The lender is not likely to send the debt to collections. Instead, the lender will likely threaten a lawsuit. A judge will review your loan contract, and the judge will determine how much you still need to pay. Your wages may be garnished to meet the debt. The judge may also set a payment schedule for the debt, which is similar to declaring a Chapter 13 bankruptcy. Whenever debt is forgiven or settled, you may be liable for some tax payments on the forgiven sum. 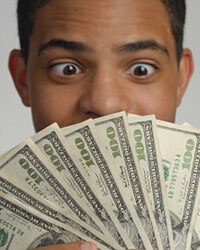 When you secure a loan, you are given a source of income to spend as you desire. You spent the money on education in this case. Since you will repay the sum plus interest, it is not actually counted as income. However, if you fail to repay, then the debt was actually income. You may be taxed on the income in the year the debt is forgiven. You will have to work with a judge to settle the debt if you do not want to face tax penalties.